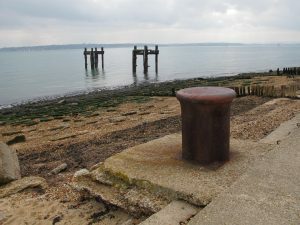 75 years ago, the Hampshire coast at Lepe saw frenzied D-Day activity, combining an embarkation area for men and vehicles, Mulberry Harbour construction and the PLUTO fuel pipeline. Recent research and archaeology has cast new light on these events and Stephen Fisher shows us around the site in an update to his walk two years ago. Further details including meeting place and directions will be sent through once your booking is confirmed. Please note that all walks, once booked, are non-refundable unless of course CBA Wessex has to cancel or rearrange the date of the walk due to unforeseen circumstances. Please see our Terms & Conditions for more detail. If you are unable to book your walk online then you should contact our Walks Secretary at walks@cba-wessex.org.uk , giving your name, contact telephone number and email address together with your choice of events you wish to book. It is important you let us know how many member and/or non-member places you require for each event. Please do not pay until you have received a confirmation email from our Secretary. If you have access to internet banking then after you have made a booking and received your confirmation it is easiest to pay CBA Wessex by direct payment to Sort code 20-75-01 Account number 43040208. You MUST quote your surname and event date(s) in the payment reference field in order that we can match your payment to your booking(s). If you are unable to pay through internet banking then you should make a cheque payable to CBA Wessex and send it to our Treasurer at 71 Codicote Road, Welwyn, Hertfordshire, AL6 9TY. Please accompany your cheque with a note to let our Treasurer know who you are and the date of the event(s) you are paying for, also whether you booked online or through our Events Secretary. It is OK to make one payment for multiple bookings. We simply need to know what your payment is for in order that we can match it against your booking(s). Unfortunately your booking is not confirmed until payment has been received by CBA Wessex.